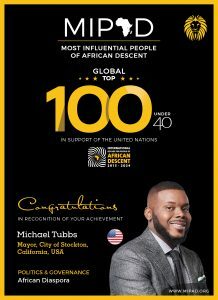 Michael Derrick Tubbs is an American politician, currently mayor of Stockton, California. Elected as mayor in 2016 at age 26, he is the youngest mayor in Stockton’s history and its first African-American mayor. Tubbs announced his candidacy for Stockton Council District 6 for the November 6, 2012 general election, running against incumbent Dale Pritchen. He won the primary and received a $10,000 campaign donation from Oprah Winfrey after meeting her while she toured the Stanford campus. Tubbs went on to win the election, receiving 61.7% of the vote, and took office in January 2013 at the age of 22, making him the youngest councilmember in Stockton history and one of the youngest elected officials in the United States.His candidacy was also the subject of a documentary, True Son, which premiered at the 2014 Tribeca Film Festival. Tubbs announced his candidacy for mayor of Stockton on September 2, 2015, running against incumbent Mayor Anthony Silva in the 2016 general election. He was endorsed by President Barack Obama on November 2, 2016, less than a week before the election. He went on to win the election, receiving 70.6% of the vote and becoming both the city’s first black mayor and at 26 the youngest person to hold that office. His term in office began on January 1, 2017.